The Global Truss Curtain Call is a mobile drape support system, which is lightweight and easy to set up. 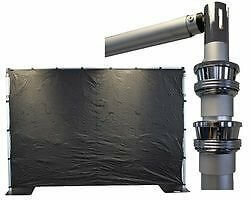 Ideal for mobile/stage backdrops, and enclosing preparation areas. This is for 2 x uprights, 1 x crossbar and 2 x baseplates inc spigots. Please note drape not included but can be added for an extra £65.00.